Tonight, the cloud will break to give some clear periods. Cloud may start to thicken again from the east but it should stay dry, with lowest temperatures from 0C to 3C (32F to 37F). You can find the latest detailed BBC weather forecast for where you are, here. People living in Copeland will be able to use their smartphone to complain about unwanted noises. Copeland Council is now accepting complaints through the Noise App, which can record a 30-second clip of the disturbance. Jackie O’Reilly, the authority's public protection manager, says the app is available through all the usual stores, and when it has been tested with local people they have approved. Quote Message: We know that residents like to be able to report noise as it's happening, and this provided a 24-hour, seven-day-a-week approach to reporting and it also allows a very quick and easy way to make a recording that can then be shared with Copeland." We know that residents like to be able to report noise as it's happening, and this provided a 24-hour, seven-day-a-week approach to reporting and it also allows a very quick and easy way to make a recording that can then be shared with Copeland." Cumbrian Lib Dem MP Tim Farron has welcomed extra training being given to the staff in emergency dental centres in some of the county's hospitals. The Cumbria Partnership trust which runs the hospitals says giving the extra skills in sedation should reduce a waiting list that currently exceeds 18 weeks in parts of the county, because currently patients have to go to clinics away from Cumbria for such treatment. Mr Farron said he welcomed the move, although the underlying problem was a shortage of NHS dentists. Barrow's MP has urged people to respect each other, ahead of a public meeting he's called tonight to discuss Brexit. John Woodcock says he was dismayed to receive messages from some constituents saying they were worried about attending tonight's Brexit Forum in Barrow because they were intimidated by the angry atmosphere surrounding the issue. The independent MP for Furness, who supports a public vote on any deal, says he wants to hear directly from constituents and hopes people of all views will not be put off from attending the discussion at St George's Church Hall at 19:30. A 33-year-old man seriously injured when he was attacked in the Waterside area of Kendal last weekend is no longer in a critical condition in hospital in Preston, police said this afternoon. Two men have been charged with attempted murder. A call for extra funding for schools in Cumbria will be made at a full meeting of the county council next week. If the motion is passed, officials will write to the Department for Education in London. Government funding given to Cumbria County Council for repairs to the “ageing” school estate, has fallen from £6.7m to just £4.7m in five years, a meeting of the Labour and Liberal Democrat cabinet was told. Roadworks are currently causing delays at two places on the A66 at Cumbria, at Crossthwaite roundabout near Keswick, and Stoneybeck, near Great Broughton. Most of the afternoon will be dry and there should be the occasional bright or sunny interval. It should be warmer than recent days, with highest temperatures from 10 to 13°C (50 to 55°F). You can always find the latest BBC weather forecast for where you are, here. Firefighters in Cumbria have warned laptop computers could catch fire if left on fabric-covered surfaces, such as beds or sofas. It follows a fire in a bedroom at a home in Soulby, near Kirkby Stephen, caused by a computer which damaged the property although no one was hurt. Edward Burrows from Cumbria Fire and Rescue Service said laptops are powered by lithium batteries that can get very hot, and using them on a soft surface can block the cooling vents. It may be this winter's last hurrah, but the snowfall of earlier this week inspired some of the county's photographers. This is Levers Water, a small tarn on the east side of Coniston Old Man, augmented by the dam you can see on the left to power the copper mines that once made the place famous. Our thanks to Chris Avery, who sent it in. 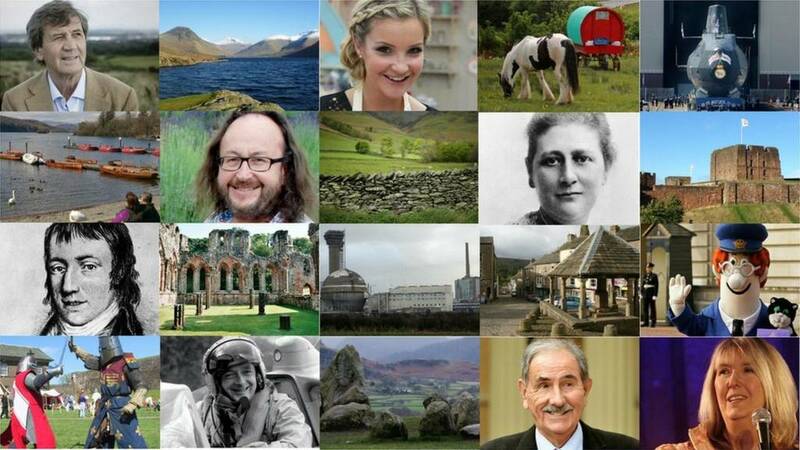 If you want to share a photo with the county, you can email them to us, or send them using Twitter where we're @BBC_Cumbria. Visitors to the South Walney nature reserve will be able to use the new visitor centre this weekend. The Cumbria Wildlife Trust is holding a family fun day to celebrate the reopening of the building, which has a display of strange objects that have been washed up on the beaches, as well as displays about the seals and birds that can be seen there. A press regulator has cleared a Cumbrian newspaper of inaccurately reporting on the strike action taken by its own journalists. The National Union of Journalists complained to the Independent Press Standards Organisation (IPSO) after the Cumberland News published a short article in December. The union argued the piece had left out important information, but in a ruling, IPSO found that the article was not inaccurate, as the newspaper had "accurately summarised" that the action was being taken over a pay dispute. Workington Town manager Leon Pryce says the team are fully focused on tomorrow's game against London Skolars, despite being days away from facing Leeds Rhinos in the Challenge Cup. Pryce says that they feel previous games against Skolars could give Town the edge. We've won five games out of six, I think, so we've got a nice bit of form going, we always take one game at a time." Around 75 people who were on care programmes with the charity South Lakeland Mind are coming to terms with its closure. The organisation shut down last weekend after years of money problems. Those on a programme of counselling sessions should see those completed over the next three months. Steve, who became a volunteer with the charity after it helped him deal with anxiety, says he has seen the group save lives, and it made him feel less alone. It's the isolation that turns an episode into a crisis, the real benefit is that it's somewhere safe to go, somewhere where you see others in the same situation." Hannah Jackson, who tweets as @redshepherdess, was in the middle of lambing 1,300 ewes in the Eden valley when the snow fell earlier this week. But she still thinks they're cute. Around 3,300 people in Cumbria are now on an alert system, and for some it means they can stay at home rather than in hospital, councillors have been told. Colin Phipps, a service development manager for the council, said more people were going on to the Telecare system as it allowed a quicker response in emergencies, cut long hospital stays and gave reassurance to families and carers. Cloud: Base around 2,000 to 2,500ft (600m to 750m) in the morning, lifting to around 3,000ft (900m) in the afternoon, and above the summits at times. The assessors for the Lake District Weatherline service say full winter clothing is still essential and equipment such as crampons and an ice axe should be carried above the snow line. They say the winter climbs are not in condition and attempting them could damage rare alpine plants. The national network of Mind says it found out too late to help the South Lakeland branch of the charity which had financial problems before the Kendal-based organisation closed last weekend. Many of the dozens of people who were being helped by South Lakeland Mind are seeing their cases picked up by other organisations, and at least one former client is considering setting up a new charity. Jamie Scudamore, a national official with Mind, says there was not enough time to get involved. The organisation didn't have enough money to make ends meet, they certainly didn't report this to us until very late in the day, and we were unable to support them through that." A West Cumbrian skier is hoping to move a step closer to his dream of becoming a Paralympian. Grant Taylor, 24, from Cockermouth, is completing in the GB Para Alpine Championships in France over the weekend. He is due to race in two slalom events in the sit ski discipline.